If you are anything like me, you LOVE lasagna. 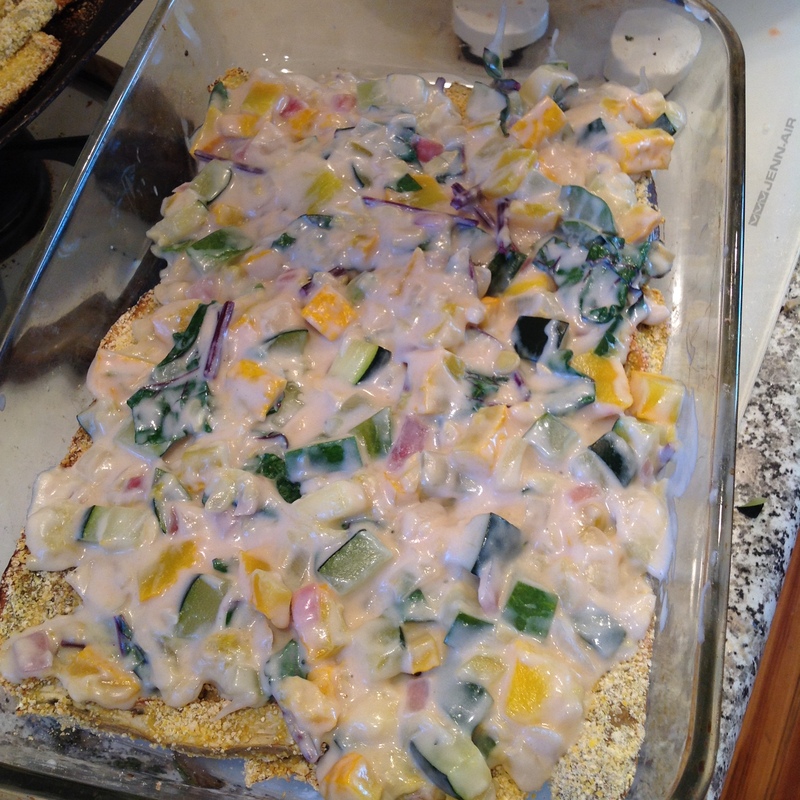 I’m basically obsessed with any form of the delicious, layered dish. 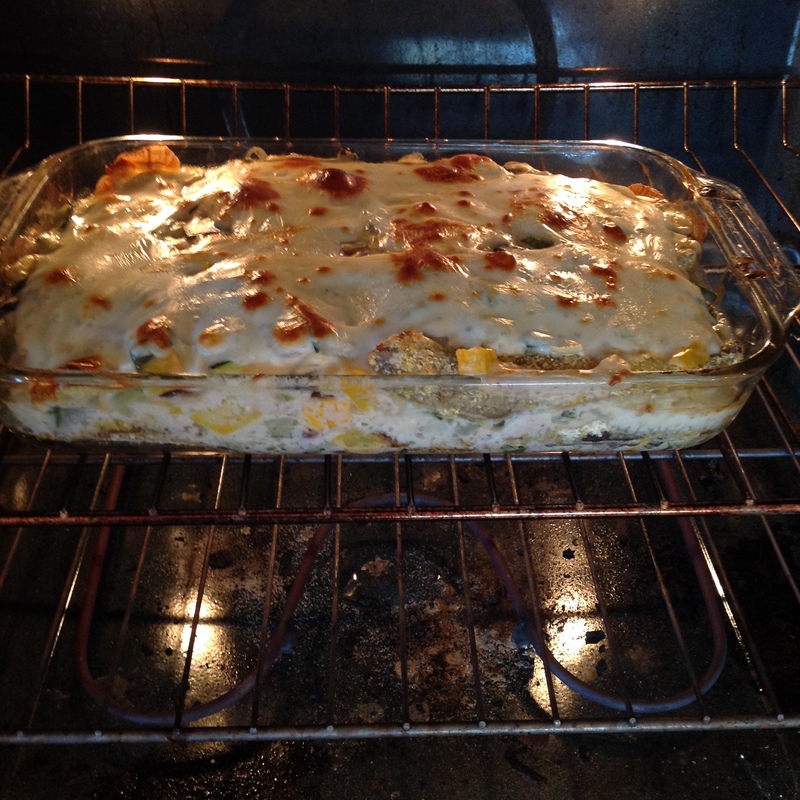 So, this summer when I was looking for a way to use up some of my garden veggies, it seemed like a perfect opportunity to create a veggie lasagna using eggplant instead of noodles! Plus, it just tastes like summer in comfort food form. Could it get any better? 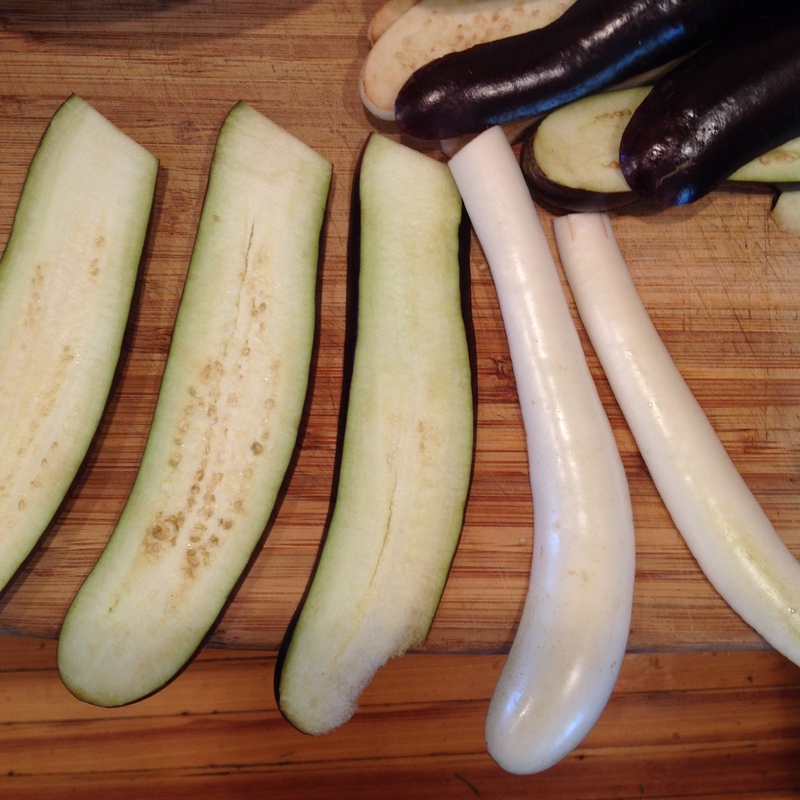 Cut the top stem off of the eggplant, and then carefully run your knife along the length of the eggplant to cut it into strips. I got 3-4 strips per eggplant and it takes 3-4 eggplants to make a layer of lasagna. 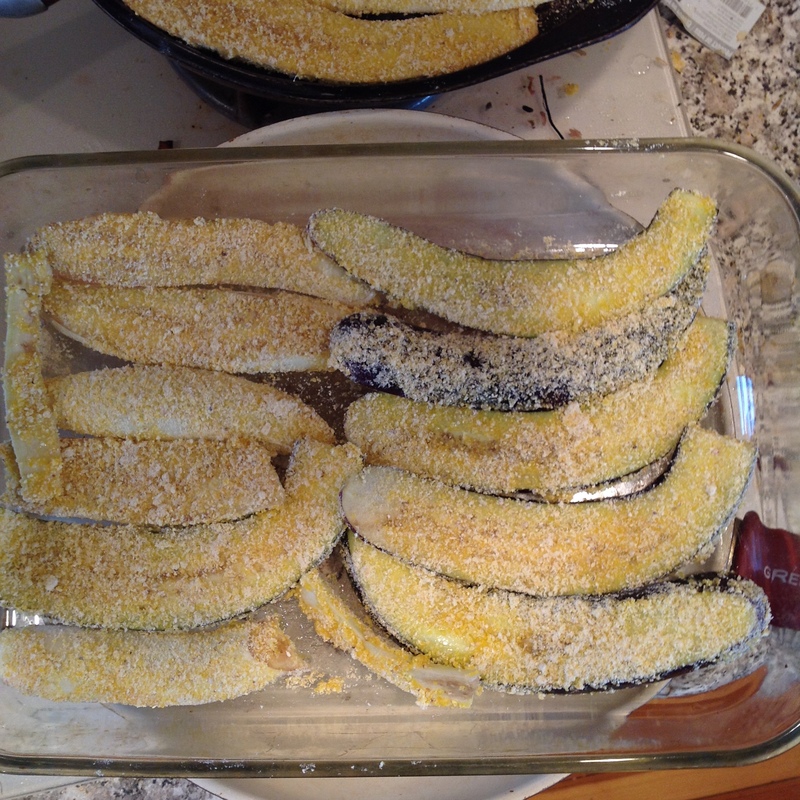 Once your eggplants are in strips, crack one egg into a bowl and whisk until smooth. Then put approximately 3 cups of cornmeal in a bowl and add white pepper, salt, and garlic salt. You can also add any other spices you like here, these are just my faves. Grease each of your three pans, one of which should be a 9×13 baking dish. You can use any form of cooking spray or oil of your choosing, but I prefer to use a cold stick of butter and rub it all over the sides and bottom of the pans. 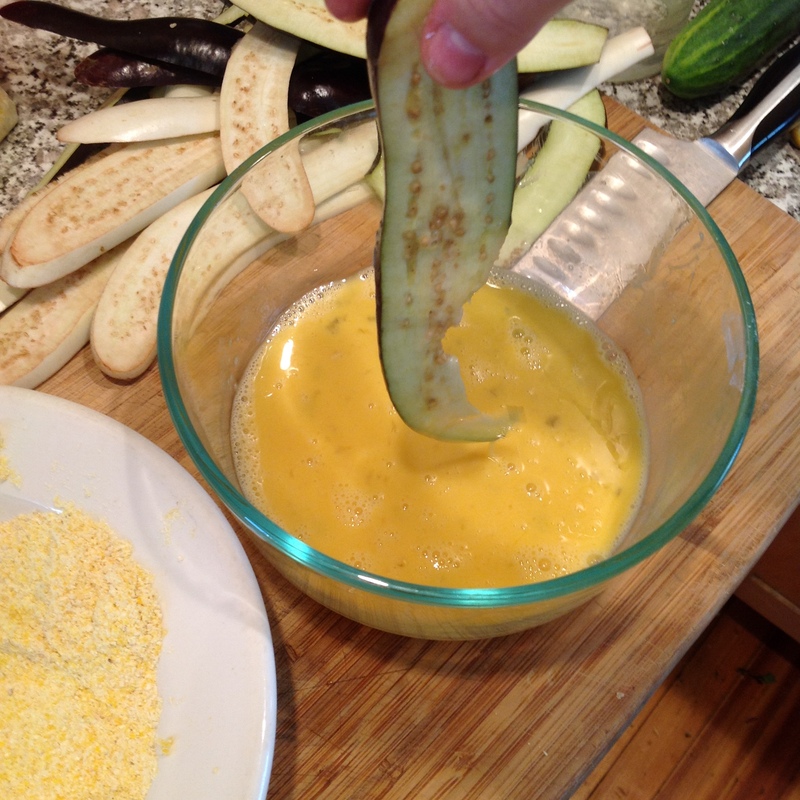 Take each strip of eggplant, and dip it into the egg wash, then coat it in the cornmeal mixture. Once coated, lay each strip on one of your greased pans. When you run out of egg, just crack another one into your bowl and whisk until smooth. Using only one egg at a time helps to eliminate any leftover egg waste. 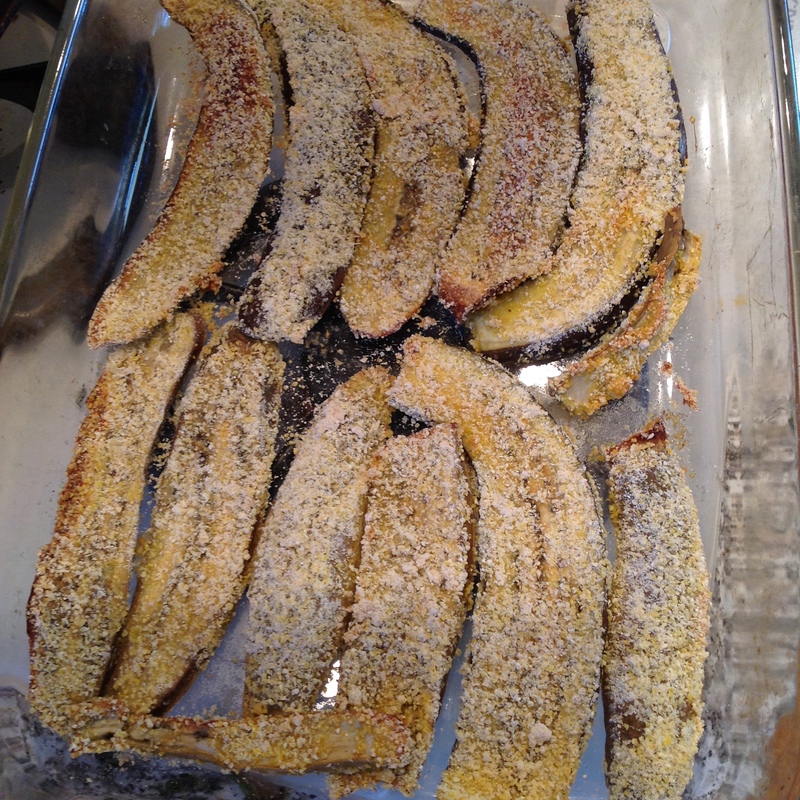 Place your pans of eggplant into your preheated oven and set the timer for 30 minutes. 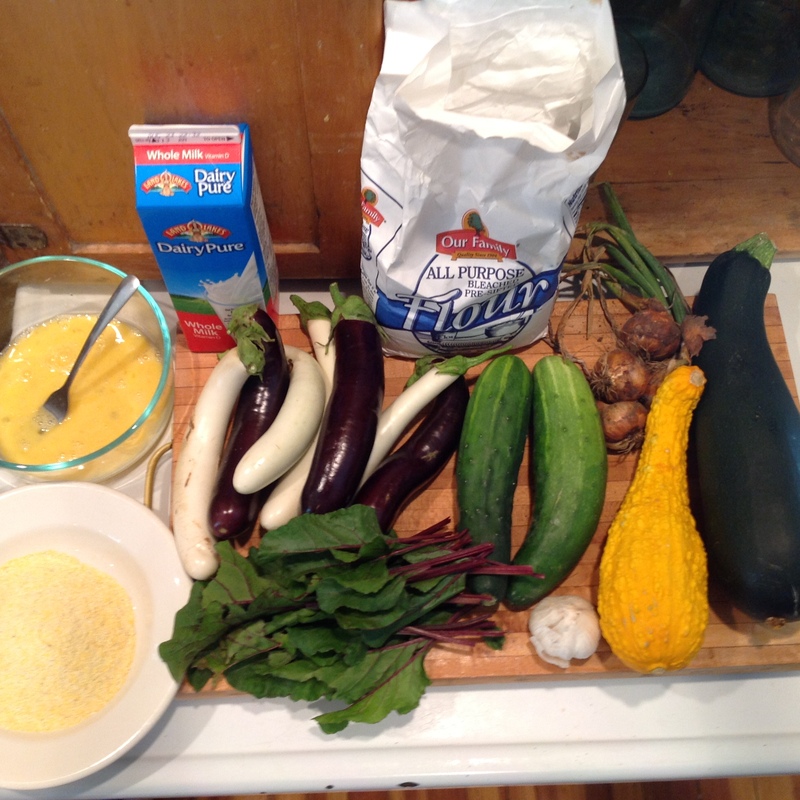 While my eggplant is in the oven, I make my delicious veggie filling. 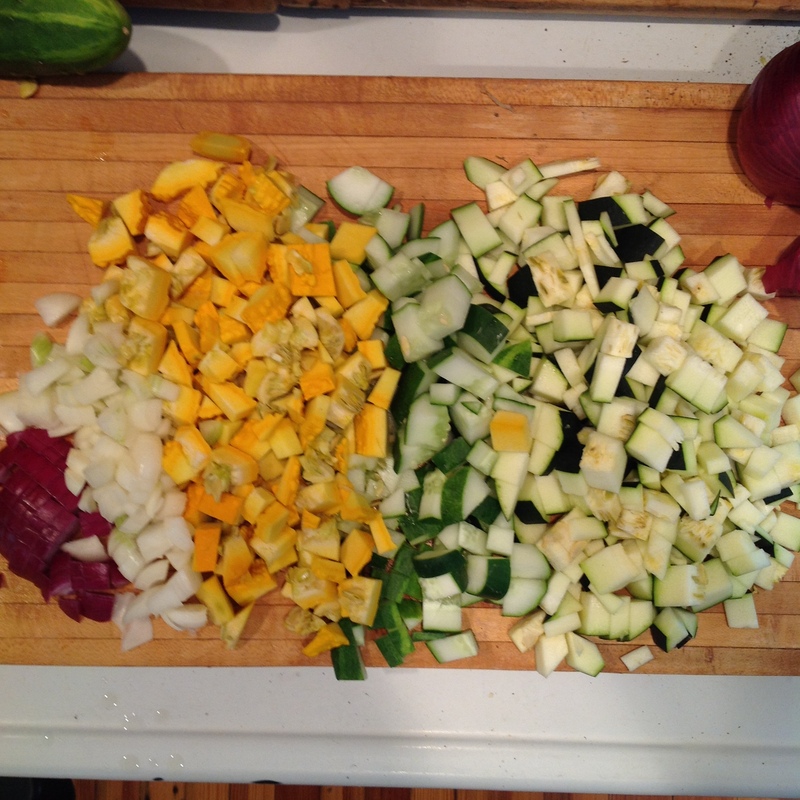 To do this I first chop up all of my veggies. I have no real measurements for how many veggies to use, I just keep chopping until I fill up my largest pan, which is 12 inches in diameter. Place a large skillet on medium low heat and add a couple tablespoons of oil. 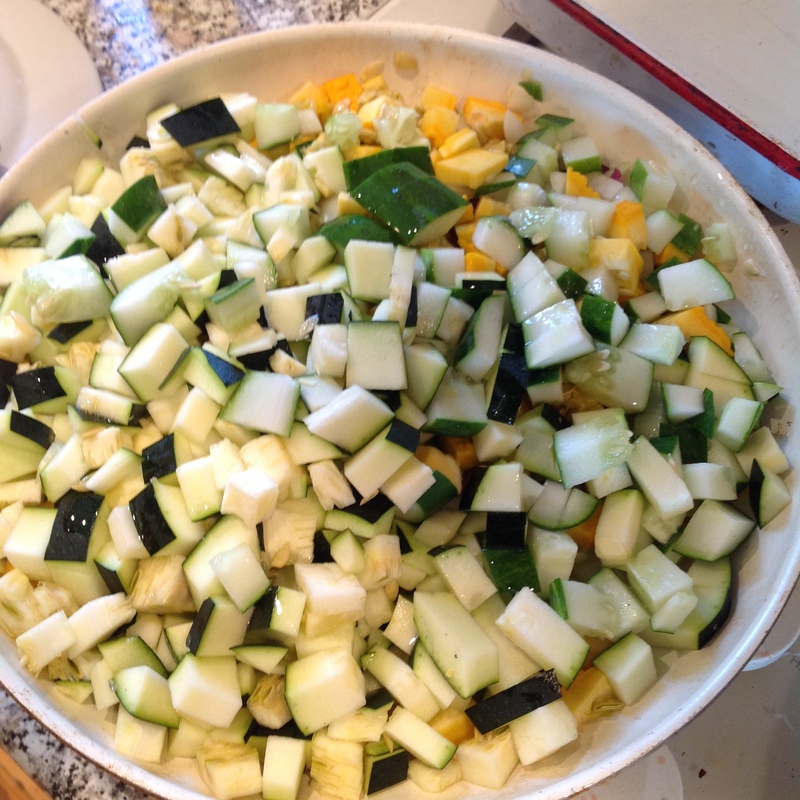 Then add your chopped veggies (minus the beet tops) with salt to taste and stir occasionally. 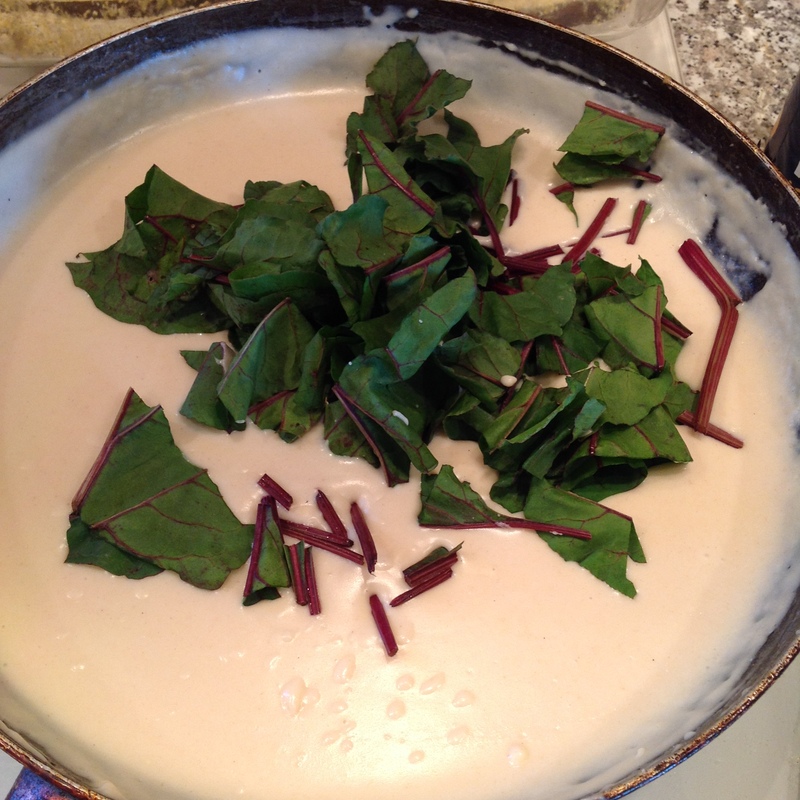 If you have never had a béchamel sauce before, you are going to love it! It’s a simple white sauce that really brings this lasagna together. In a second large skillet, melt 5 tablespoons of butter over medium heat. 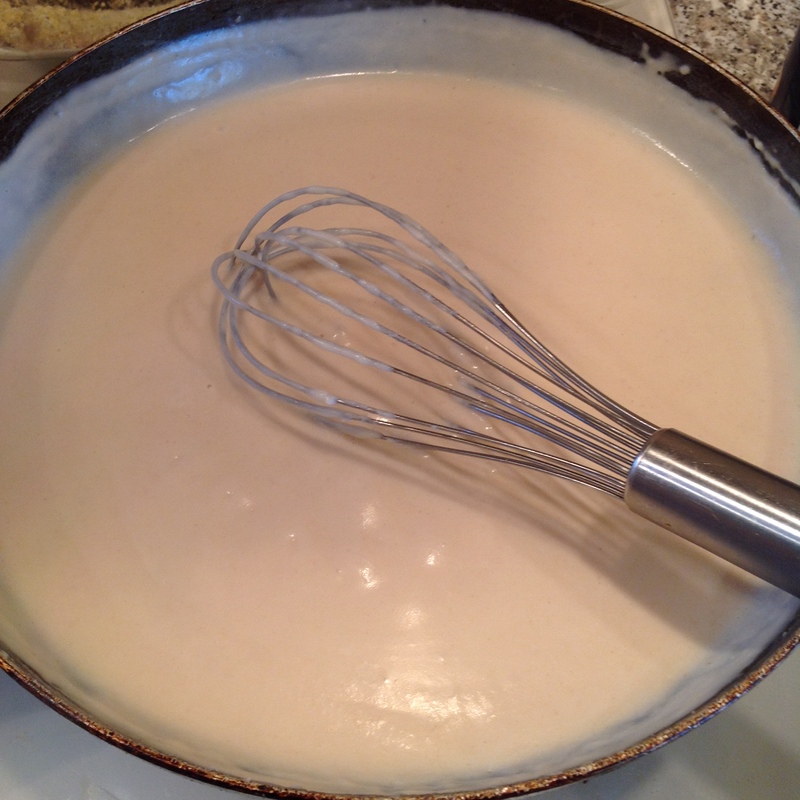 While the butter is melting, put your 4 cups of milk in a sauce pan and heat to just below a boil. 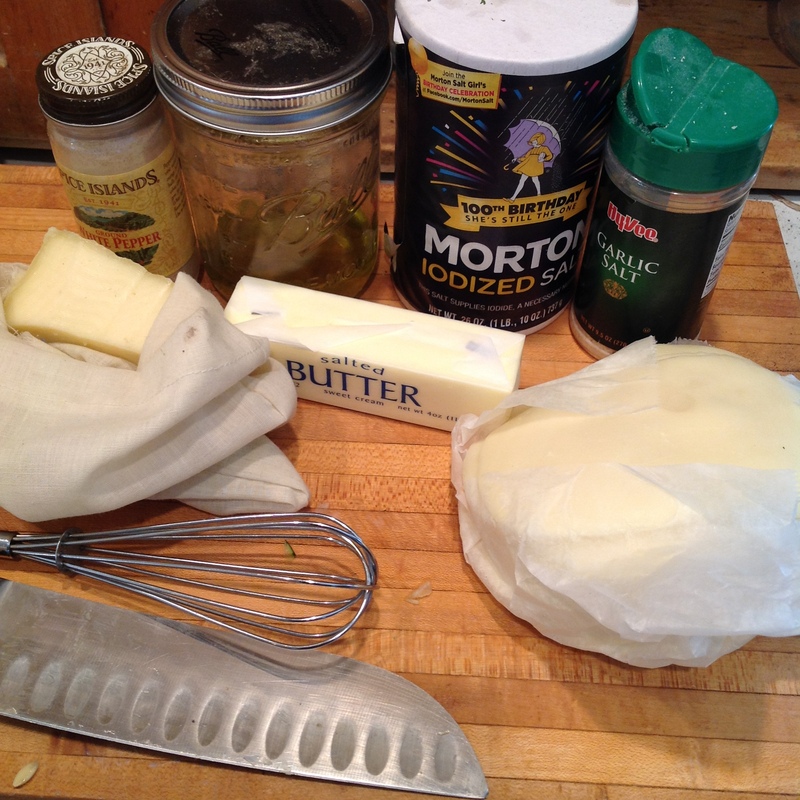 Once, the butter melts add 4 tablespoons of flour and whisk the mixture together until smooth. Let this cook for about 5-6 minutes. It should be a sandy brown color. 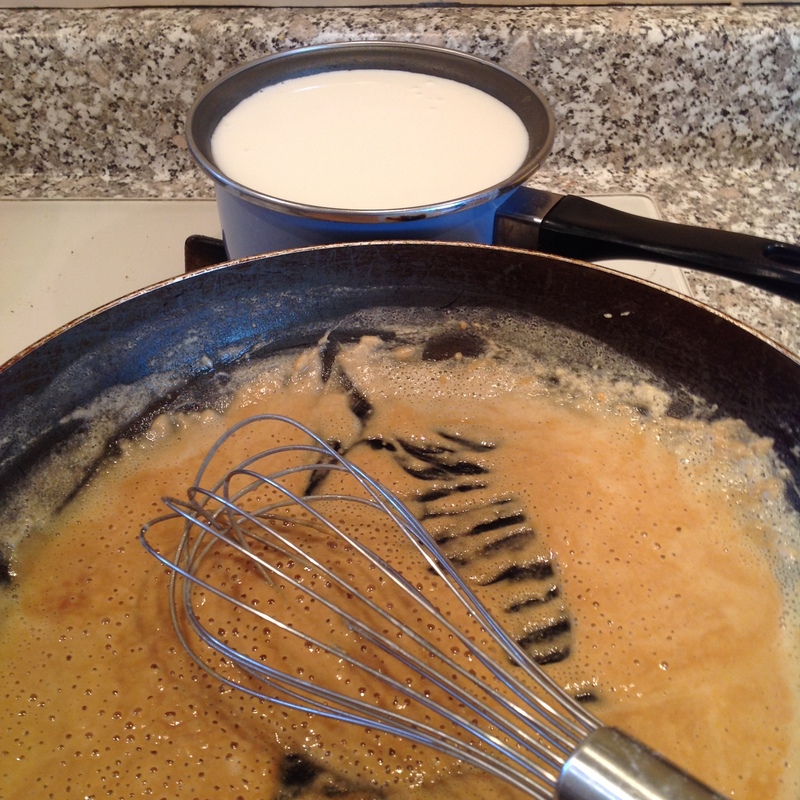 Once your mixture has browned, start adding your hot milk one cup at a time whisking it in as you go. Once all the milk is incorporated, bring the mixture to a boil and cook for 10 minutes whisking continuously. Once your sauce is done, take your veggies and the sauce off of the heat. You’ll know that your veggies are cooked if the onion has just started to become translucent and soft. 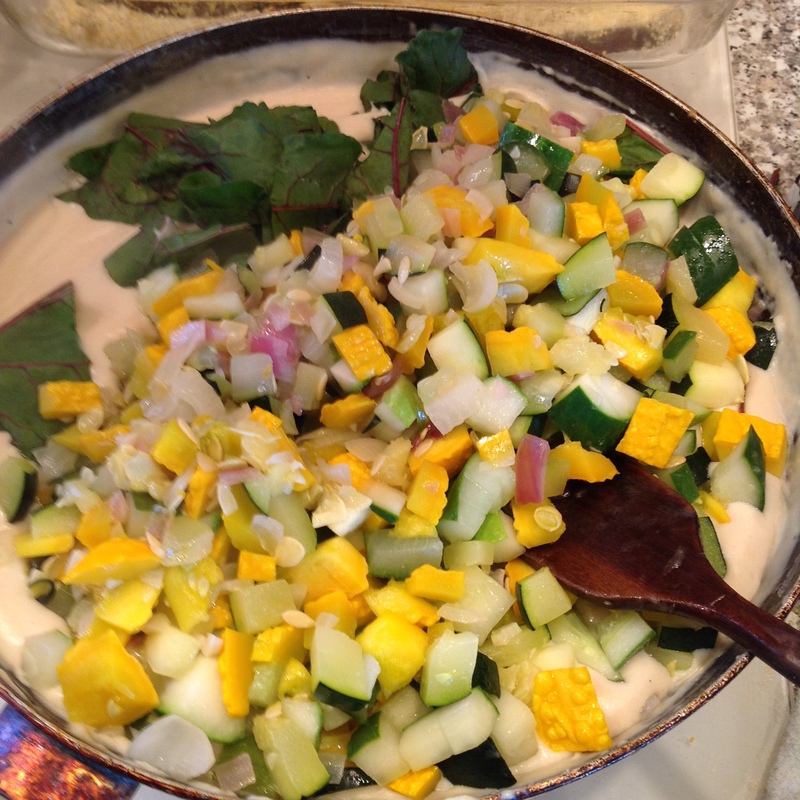 Then, add your beet tops into your béchamel sauce along with all of your cooked veggies. Mix this all together, adding salt to taste, to create your lasagna filling. 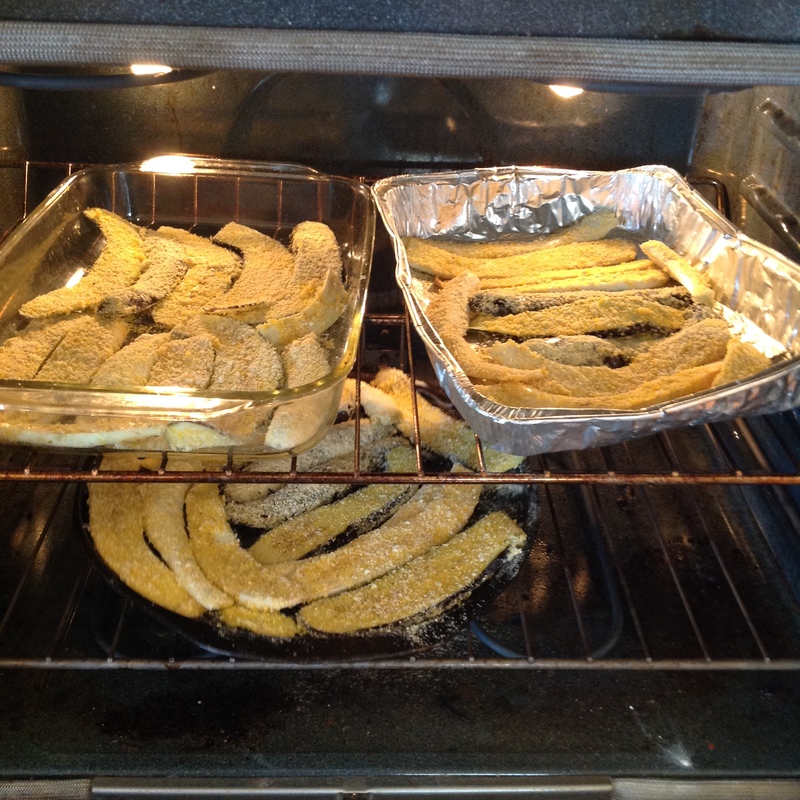 Once your eggplant has been in the oven for 30 minutes, pull it out and turn the oven up to 450 degrees Fahrenheit. Then start to assemble your lasagna. Take your 13×9 inch baking pan which should already have a layer of baked eggplant in it, and add about a third of your sauce mixture. 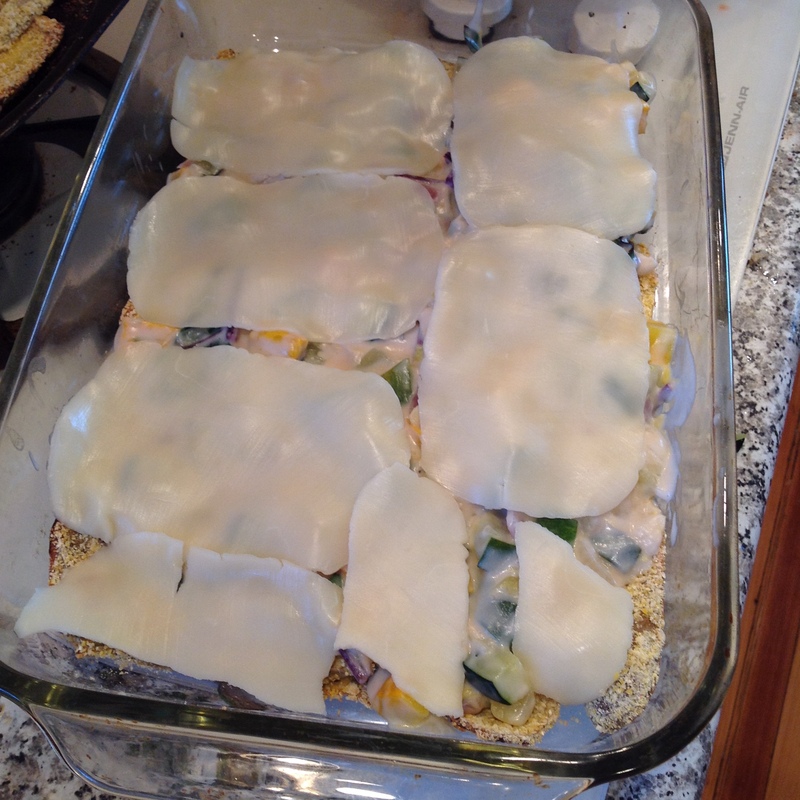 Then take your cheese, which can either be slice or grated, and add a layer on top of your sauce. Repeat this layering of eggplant, sauce and cheese twice more ending with a heaving coating of cheese on top. Once you have assembled all three of your layers (or more if you used a different sized pan or if you just wanted too), pop you lasagna into your oven for about 10-15 minutes or until the cheese on top is bubbly and browned. I just want to clarify that step ten is the single most important step in this entire recipe or else all of this hard work will be for nothing. Once you have finished baking your lasagna, take it out of the oven and let it cool. Then, compost all of your food scraps, and dig in! !